Coach Tours . . . This follows on from School Bus from Fermo. I am on a journey back to our house after having dropped off a hire car and on the bus I find myself on the school run. To my surprise I find there’s a small bus that takes me the final leg of the journey, up the hill. By the time the Porto san Giorgo to Amandola bus gets to Piane di Falerone there’s no one left standing, the remaining schoolchildren can sprawl across the seats. I’m now wondering about getting a ticket from Servigliano to Santa Vittoria. According to the timetable I still have plenty of time between buses, but it’s now coming up to one o’clock, and in Italy you buy bus tickets in tobacconist shops, and at one the tobacconist is as likely as not to close for lunch. You can sometimes get bus tickets in bars, but I’ve no idea what the arrangement is in Servigliano. As we pull up to the stop in Servigliano, there’s a small blue bus waiting ahead, and a fair number of youths get off our bus and make their way towards that one. I go with them, and take a quick look at the front of the little bus to see where it’s going. Ascoli Piceno. So this is the Ascoli bus. I’d assumed that was no longer running, not having been able to find any reference to it on the timetables that are posted at bus stops in and around Santa Vittoria. ‘Si’, he replies, one euro fifty. And he starts fishing about in his bag for a ticket. I have that in change. Meno male. Though the coins get a bit stuck to an elastoplast that’s covering the thumb of my left hand, where I’d cut myself on a kitchen knife, the plaster is beginning to disintegrate. Embarrassing, that. 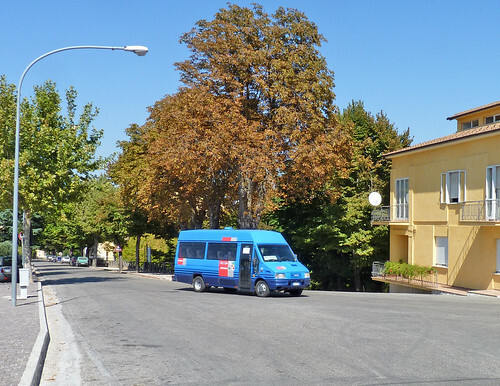 The Montegiorgio to Ascoli Piceno bus makes its way up the hill to Santa Vittoria. I think that's Santa Vittoria on top of the hill, difficult to tell with all these hills. So the Ascoli bus is still running, and you can buy a ticket from the driver. Why is it not mentioned on the timetables? I look at my ticket. START, it says. Ah yes, that will be it, the timetables have been put up by TrasFer, a different company. START have not seen fit to post their timetables, and in fact the TrasFer timetables are new, previously there were no timetables, you knew about the times of the buses in the way you always did, by asking someone – though we’ve never managed to find anyone in Santa Vittoria who knows when the buses run – or by phoning the bus company, if you know who the bus company is. But now we know. And now we’ve downloaded the timetables from both the START and TrasFer websites so we are among the few privileged people in Santa Vittoria who know when the buses run. There are more buses per day than we thought. The little START bus made its way up the hill to Santa Vittoria, the hill we’ve driven so many times and it was so much more pleasant doing it in a bus. Seemed to take less time. Youths got off along the way, and an elderly lady got on at Curetta and asked for: ‘Santa Vittoria’. One euro five cents from here. I got off at Santa Vittoria with a gang of youths who all said to the driver, ‘Ciao’. ‘Ciao, grazie’, I said as I got off. ‘Prego’ replied the driver. 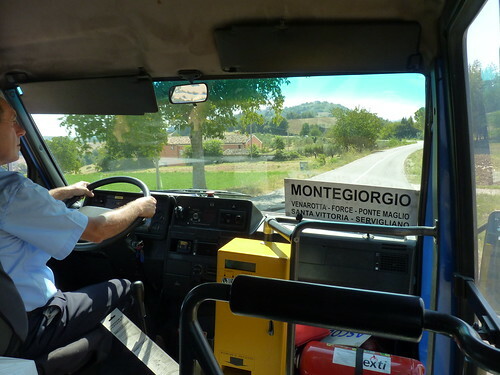 It’ll be a scenic ride from Servigliano to Ascoli Piceno on this little bus, First up the hill to Santa Vittoria, then down to Ponte Maglio, then up, up, up to Force, then down, down, down, to Venarotta and then further down into Ascoli, twisting and winding all the way. But the Italians don’t know the value of things like scenic rides on buses. And even more missing a trick, the seats on the little bus are quite comfy coach seats. Stuck in the past. That’s their trouble. And you would think that if you publicised when the buses ran, there would be some chance of people using them. But Italy hasn’t quite got the idea of the economic value of information yet. Will it ever? Who knows? The Montegiorgio to Ascoli Piceno bus sweeps into Santa Vittoria in Matenano at 1pm on a Saturday in September. No one about – it’s lunchtime. It’s called the MADEBUS, it says on the side. And who put that lamppost up? It’s not straight. The leaning lamppost of Santa Vittoria, a tourist attraction. To see comments or to comment on this page if no comment box is shown, click on a blue article title.